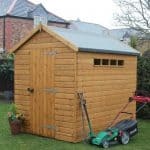 This Shed-Plus 4 x 3 windowless apex overlap shed is a flexible and strong area for garden tools and paint tins. The lack of windows would prevent thieves from seeing inside the shed and may deter them. The apex roof gives extra space and the cladding with the 8mm overlap gives protection from rain. The water will just bounce off the timber surface. 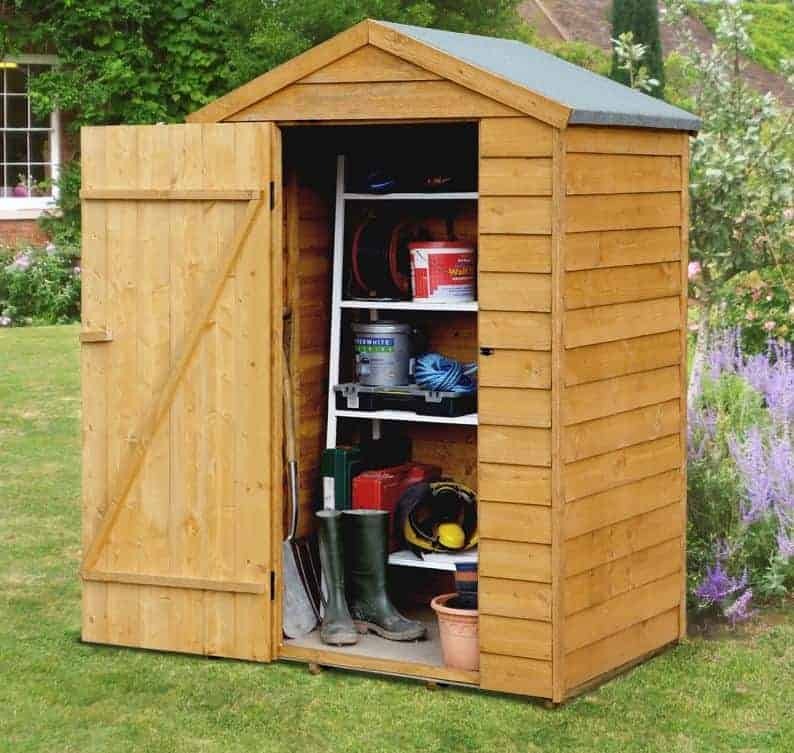 This is a wooden, overlap storage shed which provides a decent amount of space to store any gardening essentials. An apex roof not only makes it look good, it gives some protection against rain and snow. Along the centre line you will have more headroom to move around. It also gives extra height to the interior. With the heavy duty felt covering the shed has a good standard of weather-resistance. The roof is 1.87m tall at the ridge, while the eaves are 1.54m tall. Other important measurements to take note of include the width at 1.16m and the depth at 9.01m. The single door takes more the most area of the width of the shed, measuring 0.66m wide and 1.56 high. Overlap cladding tends to be the most popular construction for garden sheds. This is largely because it is cheaper and easier to use. It still manages to give the building a strong, durable finish, but it just isn’t as thick or durable as other cladding types. However, at 8mm thick, the overlap cladding on this shed is fairly reasonable. It is important to note that you will need to treat the building in order to boost its longevity. Like other sheds in the Shed-Plus collection, this one comes with double framed corners and an overall framing of 28mm x 28mm. The floor consists of solid sheet board which are fairly strong but not strong enough for really heavy items. To solve this problem you would have to buy additional floor support. We recommend you do this anyway so you are not caught out by flooring difficulty. Shed-Plus supply such products. It is really important to treat overlap sheds as soon as they have been assembled. We recommend a treatment that is spirit based such as creosote which not only provides the best protection, but it also doesn’t always need to be applied annually. You will need to check the manufacturer’s instructions to see exactly how frequently the treatment should be reapplied. Regarding the warranty, we are pleased with their 10 year anti-rot guarantee. It should be noted that there are conditions: it needs some treatment after assembly. To achieve the best results this treatment should be done as quickly as possible. Not only that, these treatments will have to be maintained, which means they should be carried out on a yearly basis. The shed is supplied with a single ledge door. This means you can easily attach a hasp and staple. However a handle may be have been a good idea too. While a padlock with a hasp and staple isn’t the most secure available, it does ensure that the doors stay shut and it should prevent small children from accessing the shed. There aren’t any windows so this is great if you’re hoping to keep the contents private. Unless you obtain that lock the shed is useless to deter thieves. The given hasp/staple is a good feature but an additional bolt may have added to the security a reasonable amount. 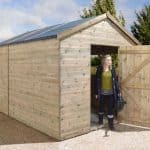 Because of the simple functionality of this shed customisation comes down to fitting a lock and maybe an alarm to the product, as well as a solar light. Items which might be useful to the interior include a tool rack and a shelving unit. 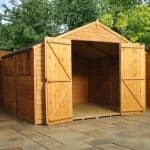 Shed-Plus sheds are good value, and although this one is smaller than most of their wares, it is still reasonable. 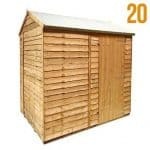 Providing you creosote the shed every year, the materials will last a minimum of 10 years. This is always good to know. The apex provides extra space, but it is still quite a small area. Not the shed for you if you have a mass of items to store. This shed should be easily installed by one person. It all slots together okay and may be done in about an hour. 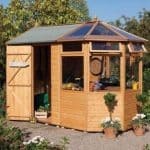 This little shed is great value for money. As established above, it is a functional shed which doesn’t need adaptations. You will have to factor in the cost of those annual treatments. Final Thoughts: Shed-Plus have created a shed suitable for storage which is simply to put up and maybe moved if necessarily. 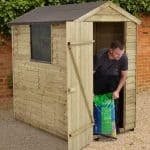 It provides a useful addition to garden storage, rather than being the one place to store all garden goods, unless you have a fairly small garden.